If I want to replace them, do I need specs for those 2 Zener diodes ? I have tested my new solder station ! But I was not lucky. "M" like "Motorola logo" and a "K"
I tried in the meanwhile to reinstall the original analog board (the one that looks new). Once again, the motherboard is OK and all the caps had been replaced. When the Logic board (mother board), is inserted, there is no sound, excepting when i switch on the power with the switch at the rear. But nothing else. I had found a broken component. It was a white rectangular cap, the one between the Logic Power Supply & CRT Power Supply. I have replaced it by a new one, and also replaced a few caps, especially the CF8 3300 uF 16V 85c , but the problem is still there : no start up. - to find an other CC ? Thank you for your idea and help. make sure your HOT transistor isnt shorted, if it is, that could cause squealing, and is the result of a bad flyback. Looks like I may be able to get this project completed soon. The resistors at position RL62 and RF11 don't look too healthy though. If I should replace them, does anyone have a clear picture or an idea of what their ratings are? Thanks to dougg3 for helping to shed some light on this one. I would recommend choosing resistors rated for 2 Watts instead. I was able to easily find 2W resistors with dimensions of 4mm D x 10mm L that will fit in the existing resistor spaces on the Analog Board without issue. Updated 4th Feb. - Added resistor dimensions and wattage / power ratings. I had a discussion in the #mac68k channel where we discussed possibly using multiple resistors in a parallel circuit to reduce the heat output in this area of the board. For example, instead of using a single 47 ohm resistor at RL62, two 94 ohm resistors would be used in parallel instead to result in a parallel resistance of 47 ohms *. * Based on calculations from http://www.sengpielaudio.com/calculator-paralresist.htm . I'm not exactly familiar with this technique. What does everyone think? I'm more inclined to use a single resistor still due to space constraints, but if there are massive improvements to be had using this method, I could be persuaded to install resistors in parallel instead. 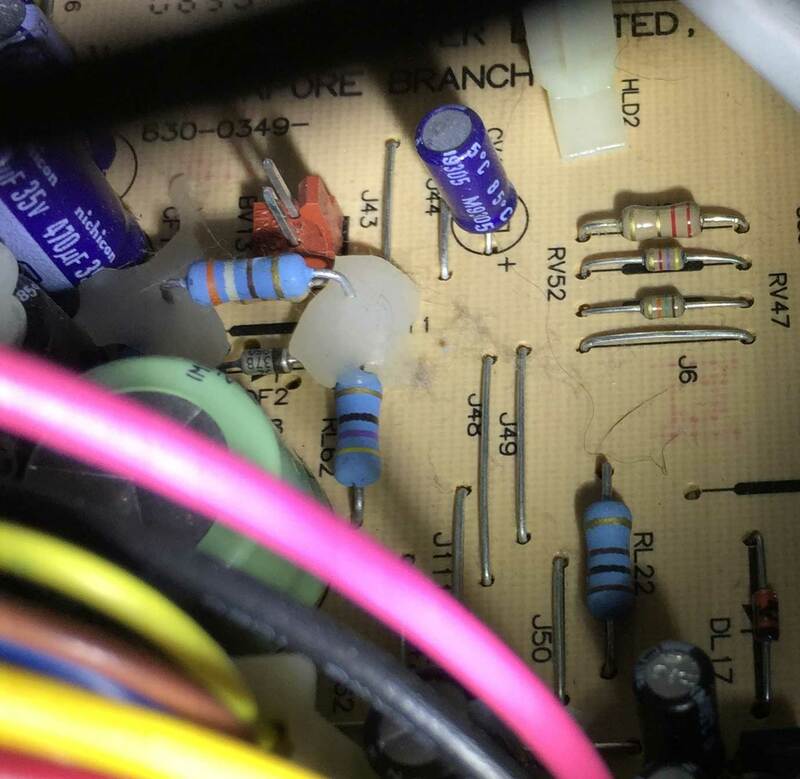 The problem are the two Zener diodes right near that capacitor. Why they put off so much heat I dont know, but just food for thought: the LC5XX models based around the same version of analog board, do NOT have those zener diodes. I wonder if we can meter the DC Voltage on the zener diodes and figure out what it is, And measure the same point on the LC5XX, maybe thats where the voltage difference comes in on 640x480 vs 512x384. Even though the CC is modded to run 640x480, I wonder if it bakes those zener diodes more. Ouch. Just priced up the replacement capacitors from element14, and they are not cheap. Simply because there's so many of them. There's about $50 in Analog Board capacitors and resistors. Then there's the Logic Board capacitors, and if you want decent Sanyo Aluminium Polymer capacitors, it's around $5 per capacitor. I'm not sure I can afford to repair this machine at this point in time, which is somewhat convenient, because element14 is in the process of restocking a new, cheaper line of polymer capacitors that should also do the job. Cant go for broke, and order cheap capacitors? Edit: Scratch that, we are talking analog deflection and power supply circuitry here... bad idea. The current capacitors I've priced up are Panasonics. There are some other capacitor manufacturers in the catalog, mainly Nichicon, Chemi-Con and Rubycon. The Rubycons seem to be rather cheap without resorting to a lower-tier manufacturer. I'll run a price comparison for those and see what happens. The Logic Board capacitors are still the most expensive. Element14 does have a shipment of Wurth Elektronik Polymer capacitors coming in that seem to be much cheaper than the Sanyos and come in a greater variety of capacitances and voltages. I haven't heard of this vendor before, but I would imagine they would still be a better option than the aluminium electrolytic cans on the Logic Board now. I went ahead and ordered half Panasonic, half Rubycon. Because Rubycon capacitors are sold individually, I don't have to order packs of 10 when I only need one, so this worked out significantly cheaper. As a matter of fact, the cost of the Analog Board capacitors and resistors was reduced to only $23 AUD - and that's even after upgrading the temperature and voltage ratings on a few of them. It saved so much that I was also able to order the Logic Board capacitors for the Colour Classic, replacement capacitors for my Apple II+, replacement capacitors and ICs for the Disk II drive and controller card, replacement EMI filters for both the Macintosh 512Ke and Plus and replacement capacitors for four Mitsubishi Engine and Transmission computers. It came to $66.13 for the entire order, with free shipping. Now the waiting game begins. I also discovered the power ratings and dimensions of the burned resistors. I've added this information to my post with resistor information above. Some of the components are backordered, but Element14 sent out the ones they had available anyway. So I decided to start on the repairs I could perform. 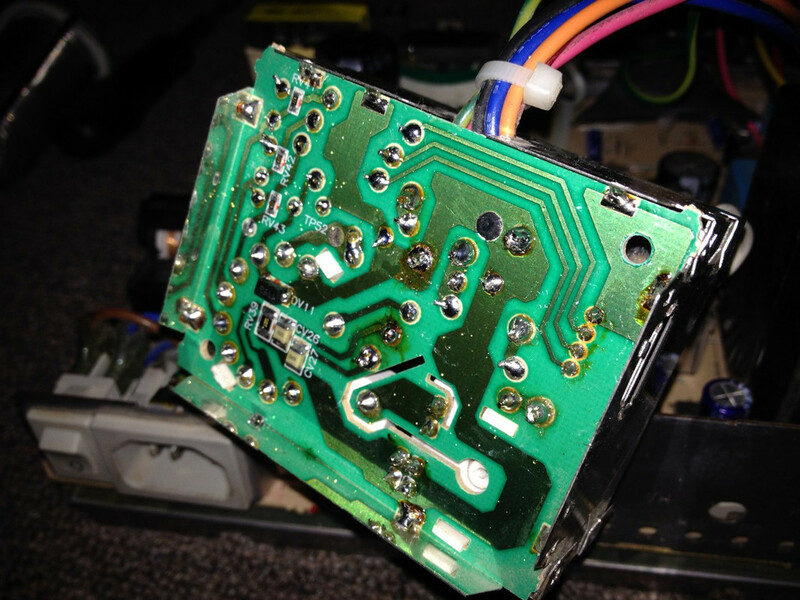 The CRT neck board was in bad shape. The solder has been touched up, but the board was still covered in flux and the joints themselves were fairly poor. I had to start over with this one, cleaning off the old solder and applying new solder to the connections. I removed that suspect capacitor from the board, and underneath it found... nothing. It's actually rather clean. 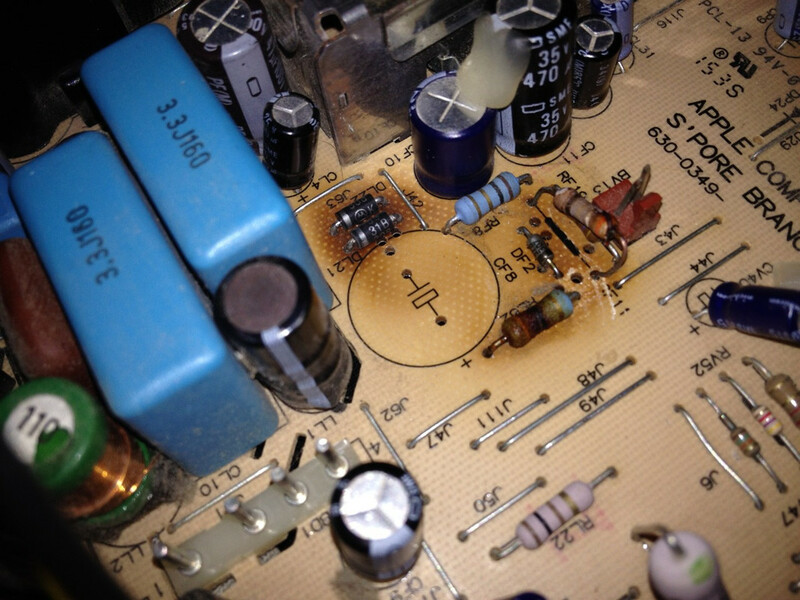 The damage to the board is the result of extreme heat being generated by the nearby Zener Diodes. The underside of the board. If you look in the center, you can see the lifted pad where the resistor at RF11 was connected. This could actually have been the issue all along. Some of the holes in the board were filled with a dried substance, I would say electrolyte but it doesn't look like that capacitor has been leaking, so it would have to have come from elsewhere. If you look toward the top left, you can also see some traces that have turned a golden-brown colour. Directly above these are the zener diodes. 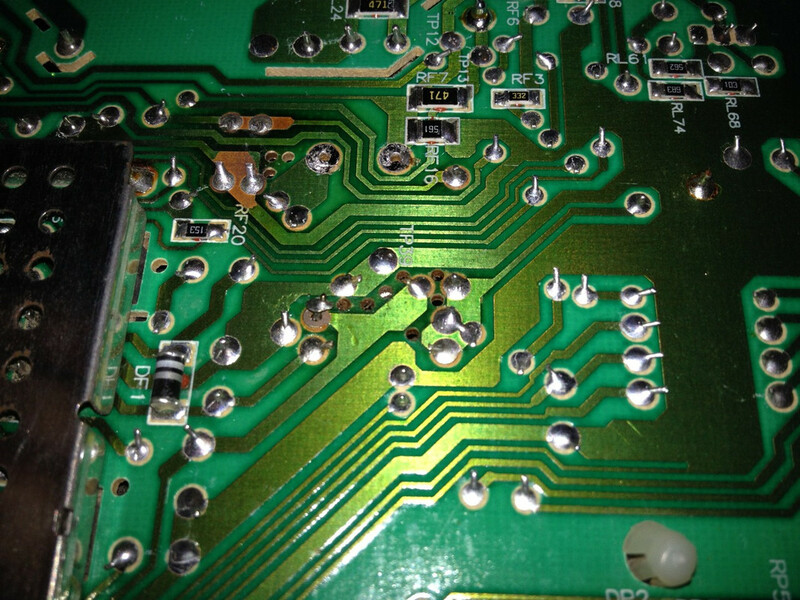 I don't even want to know how hot they must be running to produce this kind of damage on the other side of a PCB. I checked these traces for continuity though and found them to be in good shape, so I touched up the solder joints and called it done. As expected, I was rather nervous about the initial power up. I expected some crackling and a shower of sparks, but instead I got a working Colour Classic. The unstable flickering has completely ceased, and the screen geometry looks much better. It still requires some work to correct it further, but for a replacement of only two components, this is a massive improvement. 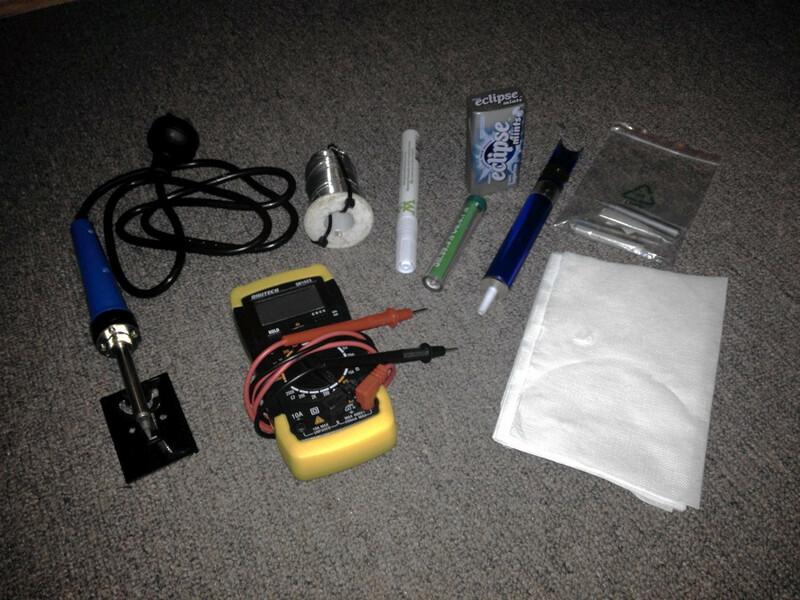 I wanted to share a photo of the tools I have to perform these repairs. They're an extremely far cry from professional grade tools, and the entire kit cost only $35, but I have to make do with what I have. This is also the first time I've soldered with flux, and I'm impressed at the quality of the solder joints I've been able to produce with it. One capacitor and one resistor down - 46 more to go. The Logic Board capacitor replacement did not go well. Despite the electrolyte that had spilled around the caps being cleaned off some time ago, the small amount that had leaked beneath the caps has corroded through two of the solder pads. As soon as I brushed them with an alcohol swap, they lifted away almost effortlessly. I can trace the connection to ground, and if I run some wire between the capacitors and the ground points on the board it powers up and runs, but I can't solder the capacitors down. 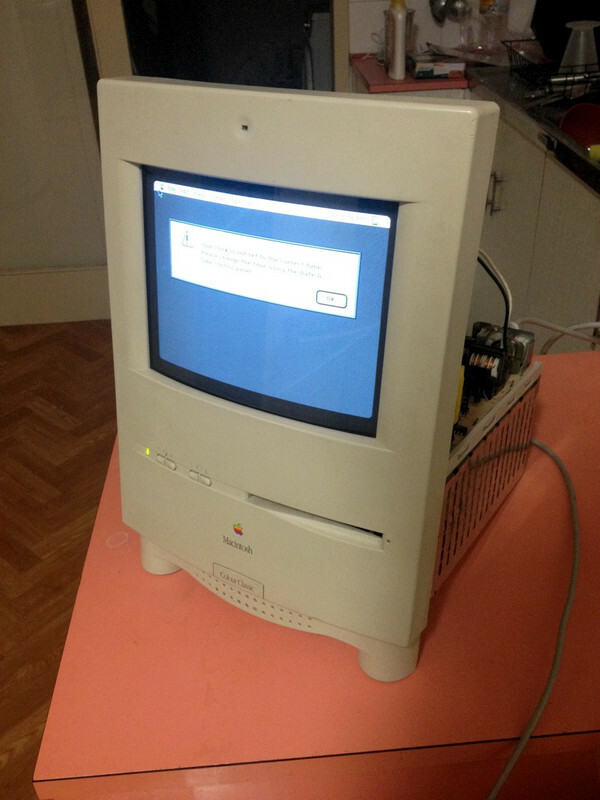 I'm considering looking for a Macintosh LC 520/550 board or another Colour Classic board. 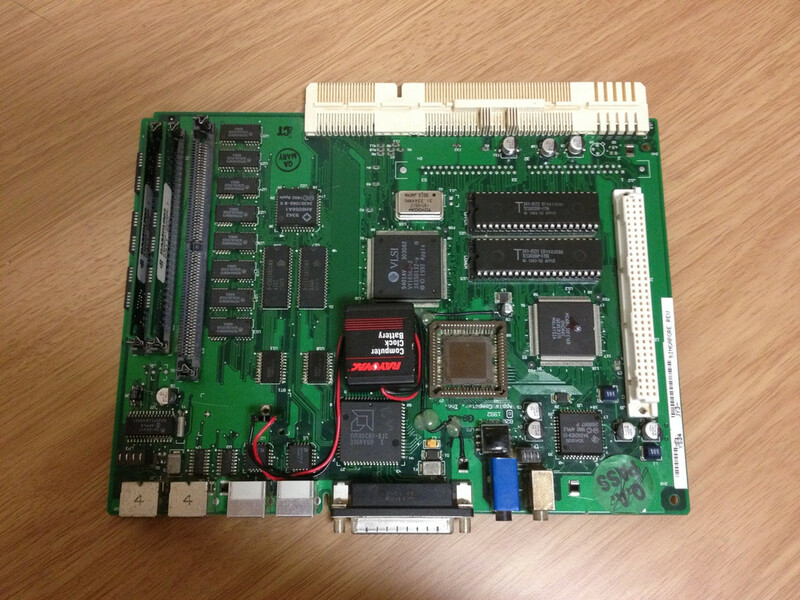 The LC boards are probably slightly easier to find, but I haven't been able to find one anywhere thus far. I managed to get creative with the two affected capacitors. The first was near an open area of the board, so I scratched back some of the laminate and soldered the second lead of the capacitor to that instead. That one was nice and easy. The second wasn't as fortunately placed. I soldered down one lead to the still-intact solder pad, then exposed what was left of the damaged solder pad and soldered the second lead to that. Now, that isn't exactly a solid connection, so I also soldered a wire to that lead and ran it to a nearby ground point on the board. I secured the wire down to the board with hot glue so it wouldn't move. The Logic Board is back in the computer and working fine, but it sure as hell isn't pretty. I know it'll be concealed within the computer and won't be visible, but I'm obsessive over these details and a bit of a perfectionist, so it irritates me knowing that kind of hack is in there. Still, it works, so it'll do for now. I guess you can look at it this way, at least you aren't waiting on getting another board to have the computer functional. So, you have time to get the right deal on one, instead of paying through the nose for the first board that pops up. I know a guy who has a couple 550 boards. Do you want me to try and get you one? Thought I'd share a few photos of the Logic Board. 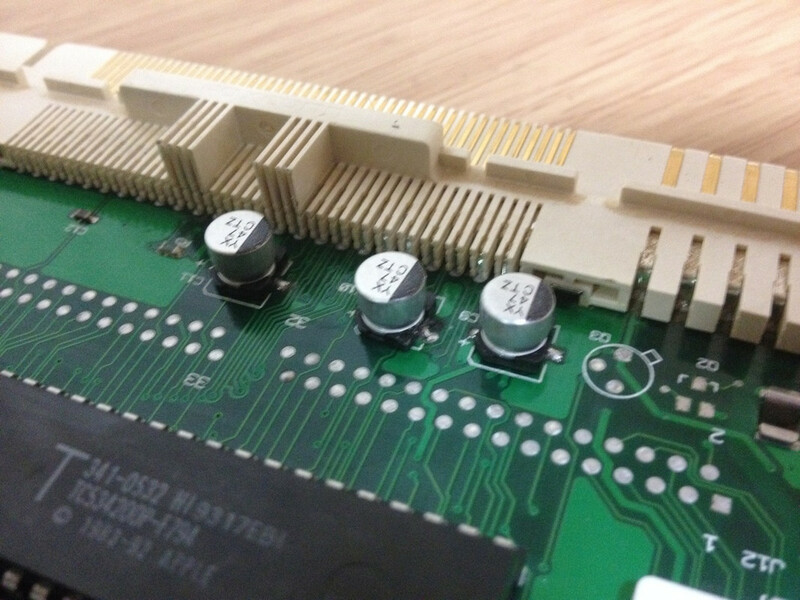 The second and third photos show close-ups of the capacitors that had to be installed with a couple of modifications. I've been told my repairs aren't that bad, so... *shrugs*. I'll let everyone else decide. It would be nice, but I'm still recovering financially from this most recent component order, and I'm assuming they'd still be worth a bit and shipping would be expensive (?). I may have to run with this board for the time being if so. Not too shabby! Rot and lifted pads are kind of a fact of life with these old machines unless you're lucky enough to find a board that hasn't had much electrolyte leakage over the years, but those are pretty rare. I just emailed him. He says he has a couple and I told him I would take one. They are cheap. It might take a little while to get to me, but I'll do my best to hook you up. Don't worry about $. Well, I'd have to be crazy to turn that down. Keep me in the loop, no rush at the moment because I still have to rebuild the Analog Board, but it would make for a nice improvement over the stock board when it's all running again. Some additional components turned up today. Some of the solder pads connecting the resistors to the board still don't look right, particularly where the board has been extremely hot, and the resistors seem to be moving easily, suggesting that the pads aren't firmly attached to the board. I've soldered some of the pins on the same track together to prevent them from moving, but I'll clean it up further when I have it apart next. I have no idea if this is a 520 or a 550, but it's here, and it's all yours, lol. I have no way to test it, but it seems to be in pretty good shape. By the time it gets to you, you may be done with the AB. pm me your addy, sir... all I know is you are in Aus. 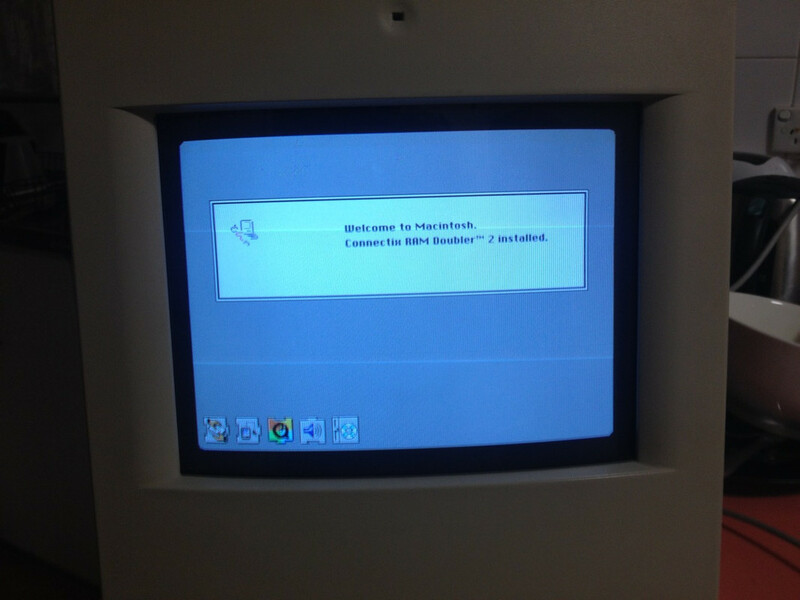 This is on the chip "MC68030FE33B" so I guess it's a 550, running at 33Mhz. 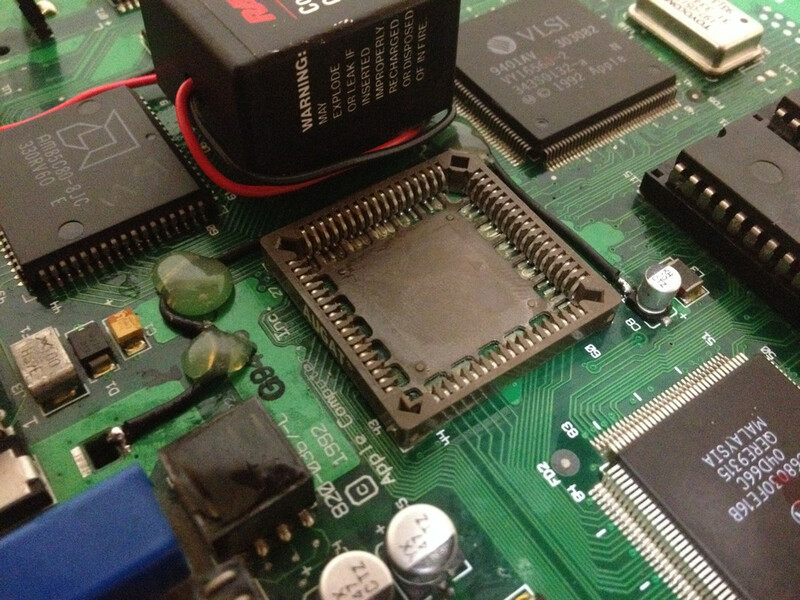 Based on the processor clock and part number in the lower left corner, I do believe that is an LC 550 board. It should make a rather nice addition to this machine, a little faster and easier to work with. The Analog Board is working, still needs a couple more capacitors replaced, but the machine is back up and running for the most part. I'll send across an email now.